After more than two years in our expanded and renovated library building, we are in the process of making some changes to the locations of some collections and services. I have always believed that you need to spend some time in a space to know whether or not the design and flow offer you the most effective use of your building. During the time since our project has been completed, we have paid attention to how the building is actually being used and listened carefully to what our library customers have told us. For example, we know that for some people, the fact that all of our large print books were on the second floor made accessibility difficult. Now that we have two years under our belt, we are making a number of changes. They are outlined below. 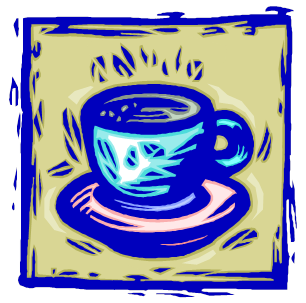 We will be making the area that was designated for young adults a “coffee shop” type o f space for all ages and will move the new large print books into that room. That means that *all* new books will now be on the first floor. We’re happy to offer our seniors better accessibility to a collection that is important to them. The teen computers will be moved to our technology center area where we will have better ability to provide technical support since staff is already up in that area. The young adult collection will move to the second floor area adjacent to the technology center where the books will be very accessible to our teens. Also, we hope that by making this change, adults will discover a whole new collection of great reading material! All the youth AV materials will move downstairs into the children’s department. We’ve had many folks tell us they don’t like having to travel from the youth department to the upstairs just to find a DVD to borrow. So those materials will be moving downstairs, allowing parents to keep their children in the area designed especially for them. 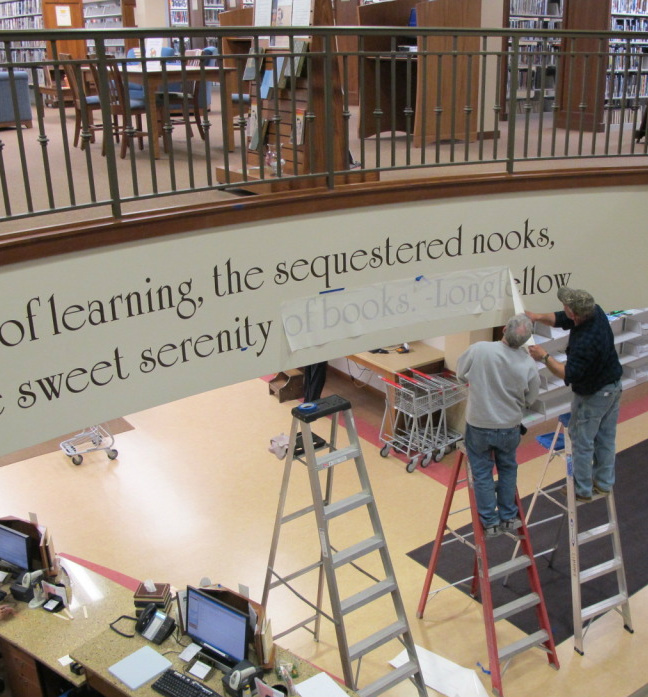 We hope to have the changes complete within the next several weeks because the changes don’t require any construction, just lots of book carts and strong backs. (And we haven’t forgotten how to move books!) If you come in and a collection is in the process of being moved, we apologize for the disruption. We’ll be happy to help you find whatever it is you are looking for. Please just ask a staff member! I’m delighted to report that the library has received a gift of art from Duncan Highsmith in honor of the late Hugh Highsmith and his wife Frances Highsmith. This art collection contains works of art that were commissioned by the Highsmith Company for their catalog covers over the years. We are delighted to receive these beautiful and original pieces and find it fitting that they are donated in memory of Hugh and in honor of Fanny. Hugh was so important to our library as a board member and also as the person who saw to it that the library became a donor designated fund in the Fort Atkinson Community Foundation. Additionally, as the founder of the Highsmith Company, he made a difference for libraries all across the world in that his company was the go-to library supplier for many of us, for many years. Fanny was a library leader as well serving as a library board member and president. She served for many years and I had the great privilege to work with her during those years as well as during her tenure on the Jefferson County library board. She’s just such an inspiration to me. I have learned a great deal from Fanny Highsmith over the years and I hope it makes her happy to know that this incredible art collection has found a home in the Dwight Foster Public Library—and it is dedicated to her and her late husband Hugh. Lois Ehlert is a Milwaukee author-illustrator-artist and Caldecott Award winner. The banners were a commission to represent different types of libraries: Myth & Fantasy, the children’s library; Dialogue, the school library; Knowledge, academic and special libraries; Universality, the public library. The banners are now hanging in the youth department in between the high windows on the main floor of the library. Another commission by Lois Ehlert: A set of puppets that can be used to tell “almost any children’s story.” The puppets are on the ledge above the new non-fiction in the circulaton area on the main floor of the library. Guido Brink (1913-2002) Milwaukee sculptor, painter and educator was commissioned to create a sculpture illustrating the human, emotional, informational and technological characteristics of libraries. The sculpture stands on the floor and is currently placed in the circulation area on the main floor of the library. 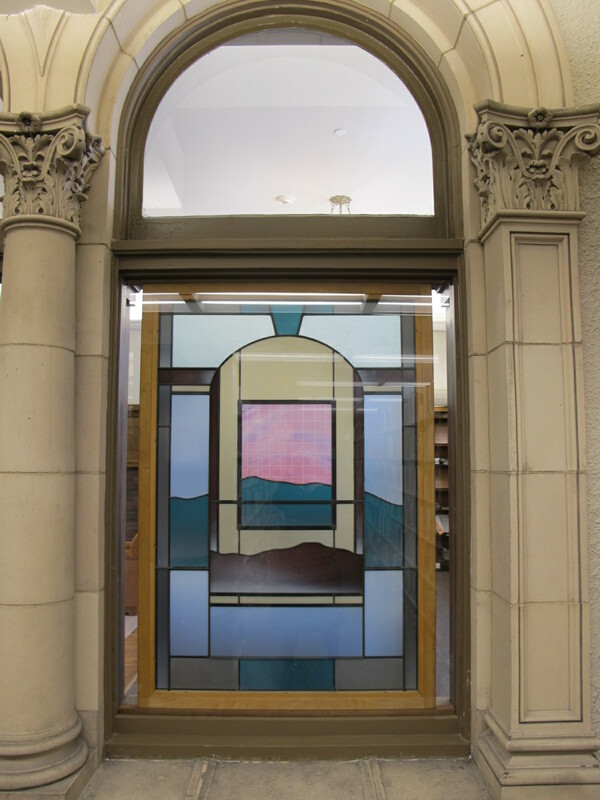 A stained glass window for a library, it is hanging in the window between the quiet study area and the non-fiction wing on the upper floor of the library. The arpilleras were commissioned from a Santiago, Chile women’s cooperative as examples of the covert communication and documentation employed by Chilean women during the Pinochet dictatorship. Such embroidered & appliquéd images were used to communicate among mountain villages through imagery and through concealed texts within the appliqué when conventional communication was forbidden. You can read more about the women’s resistance here. Two of the pieces hang in the new large print area on the upper floor of the library. One of them hangs in the Highsmith Young Adult room. Come in and see the beautiful pieces if you are able. Photographs (at least the ones from my camera!) just are the same as seeing them in person. 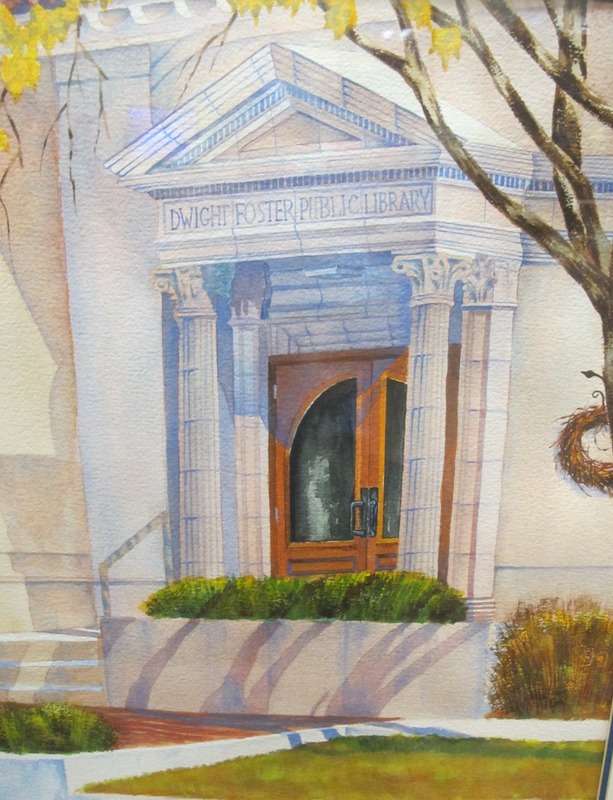 Artist Kent Parks painting of our library door…prior to its last move! Beautifully painted by local artist Kent Parks in 2005, the watercolor to your left depicts the library’s entry from 1983 to 2010. The library now owns this painting and you can see it hanging in the hall on the way to the FCCU Community Room. Come and see it in person! It’s not to be missed! From 1916 to 1983, the library’s entrance was situated at an angle at the corner of East Milwaukee and Merchants Avenues. Due to the historic nature of the grand terra cotta pieces which include the columns and the carved stone naming the Dwight Foster Pvblic Library, the entrance has actually been preserved and moved twice. In 1983 the entrance was moved down Merchants Avenue to approximately where the painting is now hanging. The ledge to the right was the entrance floor from 1983 until 2010. As a part of the library’s 2010 renovation, the entry was moved further down Merchants Avenue to offer a grade level entrance which was considered essential to making the library accessible to all. For the second time, the terra cotta was painstakingly disassembled, labeled, cleaned, stored, and finally reassembled at the current entrance location. Generous donations to the capital campaign made it possible to preserve this important historical feature. As a result, the terra cotta still stands today serving to welcome all who enter nearly 100 years after its original construction. Prior to our library expansion, we had many issues with noise in our library. Because everything was crowded, there was zero ability to allocate space appropriate to activities. If you wanted to study in a quiet area, you were generally out of luck because right next to you was a person having a conversation, a child crying, or some other sound that was guaranteed to disrupt your concentration. In our newly renovated library, we have an area dedicated to quiet. We try hard to keep the atmosphere peaceful and serene, perfect for studying, reading, and contemplating. We don’t ban computers; many people sit at the tables with their laptops or tablets and quietly work. But we do ask people to turn off the ringer on their cell phones. Here is the text of our sign posted in the area. 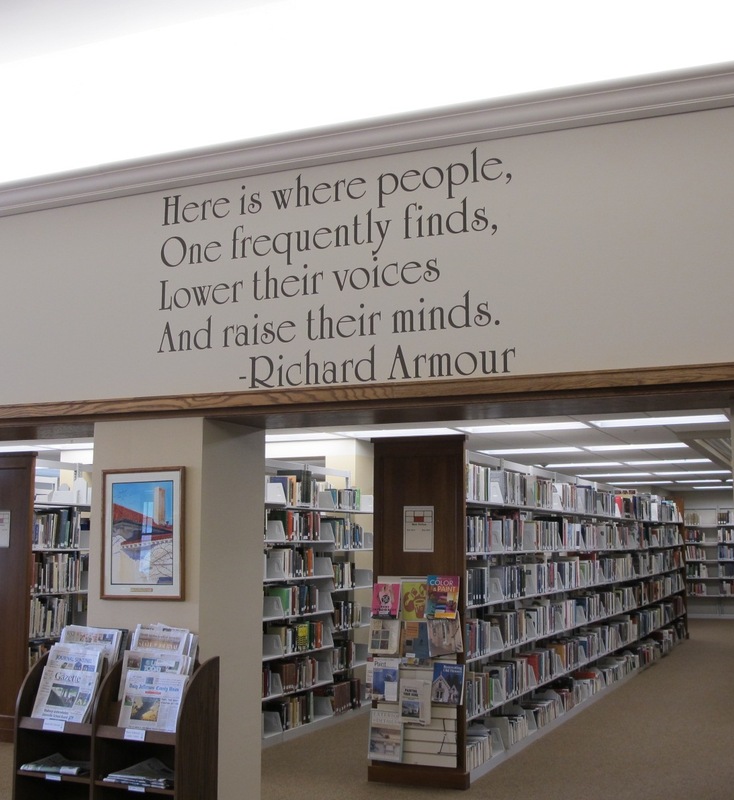 I’ve always loved that quotation because for me libraries inspire reverence. Libraries can’t always deliver on the quiet part and it’s open to debate whether or not they should. But if you have a building that is well-planned and large enough for your community, it’s possible to have a mixture of quiet and noisy spaces. A library should have a place where you can gather, discuss, and connect, a place where you can bring your baby even if you know crying is likely, and a place where you can sit alone and dream about tomorrow. One of the best things about our library expansion and renovation is that our building is now able to accommodate the widely varied needs of our citizens. It’s comforting to know that whatever the future holds, one of our library’s most important contributions is to offer a physical space for the crying baby, the cramming student, the scholarly thinker, the social connector, the happy retiree, the driven genealogist, and the auto mechanic on a mission for that electrical diagram. We have much to offer our citizens in terms of community space, much like what’s discussed in this interesting piece entitled: Libraries that matter. As libraries continue to reinvent themselves, the role of the physical space seems ever more important. 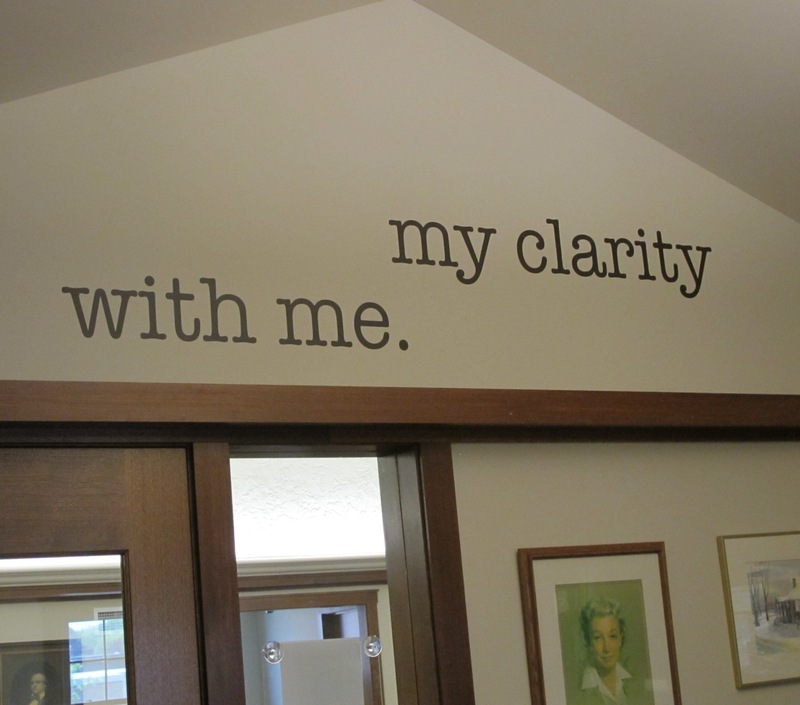 As promised, I’m sharing the wall words recently installed in our Niedecker Room. 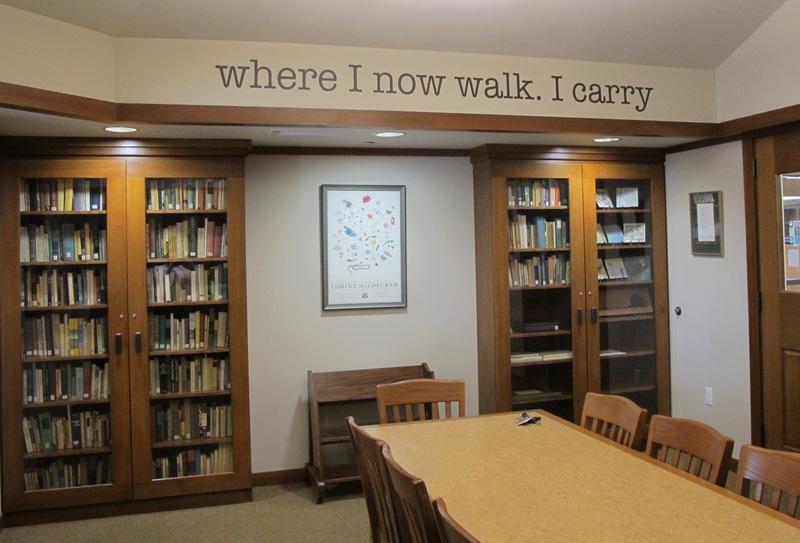 The photos don’t begin to capture the beauty of Lorine’s carefully chosen words brought to life on the walls in our library. Please note that I’m not showing *all* the wall words here. To see them all you’ll just have to visit! A great big thanks to Ann Engelman for the idea, Amy Lutzke for finding the words, Mary Kay Grunow for tackling the layout and design, and Greg Misfeldt and Jeff Armstrong for the installation. "Hey, if there's a misspelling, do you think anybody will notice?" Installation complete! I’m happy to report that it’s positioned perfectly on the wall, absolutely level, spelled correctly, and…well…simply stunning. Thank you Greg and Jeff! 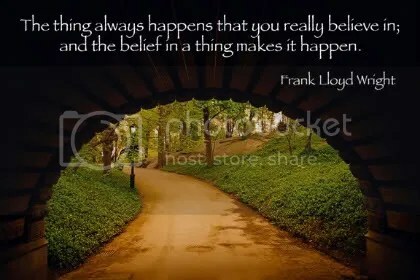 So why did we choose this quote from Longfellow? Well, because it reminds us about the importance libraries as a place. In this digital age, I think we are wise to remember the role libraries play as a public place for people who want to settle themselves into a sequestered nook and read, think, and learn. Recently there was an interesting discussion about just that at Will Manley’s blog which you can find here. (If you read the comments, you’ll see I made a comment about our library.) Will Manley is one of my favorite librarians. He actually started his career in Burlington, Wisconsin, spent many years in the profession and eventually became the city manager in Tempe, Arizona before his retirement. Irreverent yet thoughtful, if you want to learn about libraries and life, his blog is well worth reading. Back to the point. We’ve got more wall words coming. Stay tuned to see which nooks and crannies will be next. When we were in the dreaming stage of planning our library expansion, our trustees and staff frequently visited libraries to gather ideas. There is no better way to get inspired than to visit libraries who have built, remodeled or expanded. It’s also a great way to learn what worked and, perhaps more importantly, what didn’t. Kudos to all associated with the Irvin L. Young Memorial Library for continuing to do the homework necessary to find the solution to their library’s shortage of space in Whitewater. A project of this nature doesn’t happen overnight and it requires a commitment to the vision and willingness to keep working until all the pieces come together. A couple of days after the tour, we received the following email from Whitewater citizen Jim Nies. I read it and was simply awestruck by Jim’s ability to convey the importance of libraries. He’s clearly got the vision thing covered! I was surprised when I first visited the Fort Atkinson Public Library several years ago, surprised to find a beautiful Spanish mission style building, with a warm and welcoming interior, stocked with a fine collection. Visiting again after more than a year’s absence I was even more impressed. A large addition has been seamlessly integrated into the existing structure and the interior fashioned into a sensory delight. A big, sunny children’s section, centered around a reading tree, occupies a good bit of the south side of the building. Nearby, story time room is entered by stepping through a wall into a field of toadstools, ferns, and trees. Young adult space, appropriately decorated, including several “diner” booths, is well stocked with YA lit. A broad staircase sweeps up to the adult area where there are a number of private study rooms, many quiet private places, a large semi-circular periodical space featuring easy chairs spaced widely about, a very quiet research and reference area, and a large computer lab (all but one machine in use as I looked in). This library is an amazing accomplishment is this time of economic difficulty and privatization fever, for a library is the archetype of the commons, the embodiment of the idea of sharing resources for the public good. The D.F. Public Library is also an amazing accomplishment in that its reconceptualization and remodeling was done at a time when the very necessity of libraries is in question—in the digital age a bricks and mortar building housing ink on paper books seems to many to be an unnecessary extravagance. Children’s books will always be printed on paper. Although many great learning experiences are now available on the iPad, kids and their parents will always want real books. The resurgence of children’s book stores in this the age of Amazon and e-books proves the point. Kids and parents will always want to feel and smell and turn real pages, to browse through bins and piles, to listen to stories, to be with other kids. Young adults will always want to socialize, and many will appreciate the chance to do it in a safe place, where they can talk about significant things, where they can sense the power of the knowledge that is their heritage, where they can be around and read about other interesting people. The periodical room might seem an anachronism what with Google News, Huffington Post, and on-line editions. But still and always, a place to read and browse both what remains in print as well as all that’s digital, will be a place well liked by many. How pleasant many find it to sit for a spell immersed in current events, surrounded by the library’s quiet business, exchanging, perhaps, a word or two with a friend or passer-by. With wi-fi, e-reader loans, and patron access to all kinds of online subscriptions, D.F. provides the best of both worlds in one very pleasant place. Quiet study rooms, group meeting and discussion rooms, nooks and crannies for individual reading, writing or contemplation—these are all here. And then there’s the computer lab, where people who don’t have ready computer and internet access at home can connect with online resources. The reference section stocked with often specialized but often very necessary print and online information, providing the knowledge that is power, is big and bright with lots of table space and lots of elbow-room. And then the stacks. Books, multi-media materials, more books. A waste of space, perhaps when a Kindle can hold hundreds. But then…writing has been a part of us as humans since the dawn of civilization, the printed word for many centuries. As inhabitants of culture, ink is in our blood. Even the most technologically adept of us often like to read a printed book. Really, books are here to stay and so we need a place to see and touch and feel and browse, to sample and discover, to sit and read a while—we a place for books. Dwight Foster is a lovely place for such. The stacks are brightly lit, well spaced, well organized. There are plenty of comfortable chairs.